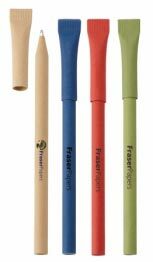 Bonsai ballpoint recycled paper pen with colored barrel and matching removable paper cap. Made with 50% recycled paper. (Pls be advised that blue, green or red pens can be printed in black ink only. 4 Color Process imprint (natural pen only): Setup: $30 + $0.20 ea. (per location). Available colours: Natural, Blue, Red, Green.